In various styles, genres and niches, 3D printing is starting to impact various industries at the present time. The extensive uses of manufacturing may include various stuffs such as engineering, marketing, product development and more. Here, I want to share with you some of the possibilities in another one of those extensive niches. 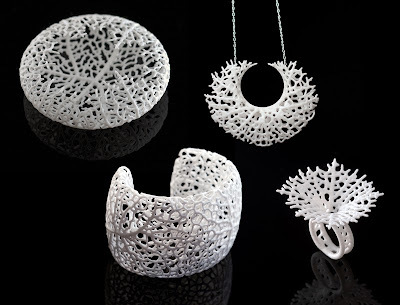 Today, I am going to talk about 3D printed jewelry. For thousands of years jewelry has been around us. In ancient time people would carve various forms of jewelry such as bracelets and rings. With changing time, the style of casting and carving of various kinds of jewelry items also changed. In the 21st century, we can see quite amazing forms of casting. The most common method involves the molten material pour into the tubes having different size and shapes. In such a way various kinds of various kinds of jewelry items are produced. The same method is followed in case of 3D printing and it has been adding some serious value to jewelry manufacturing. As I have mentioned in an earlier paragraph, the molten material run through the different shapes of tubes and get the similar shape. Once the molten material poured into the tube, it is guided to take a shape of whatever molds were present. Today, there are plenty of ways to create such kinds of mold. However, they are not as efficient as 3D printing. With the help of 3D printing, you can fabricate some seriously intricate pieces of jewelry that can work as unique products for your venture.